Living In LoCo: Jumping Jacks Sports - Snow Day Camps and MORE! With all the recent snow, cabin fever is setting in throughout Loudoun, with school canceled for 6 days in a row due to weather... then add weekends and previously scheduled days off, and the kids just aren't going to school these days at all! In our house, we've done some common and uncommon outdoor and indoor 'snow day activities'; we've done 'kid friendly recipes for snow days'. At some point, these kids need a change of scenery and people with whom they can interact. But, school is closed. Daycare is closed. Many businesses are closed. It's cold outside, and yet they need to burn off some serious energy. My cure for cabin fever this bad? 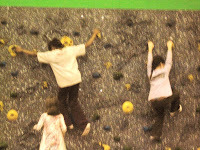 I take them somewhere that they are encouraged to climb the walls: Jumping Jack Sports! They plan 'impromptu' snow day camps most days that school is canceled. They offer half day or whole day camps, and popin playtimes on snow days! Check their web site for information on these camps, since they are often planned very 'last minute' after school closing decisions have been made. What is Jumping Jack Sports? A kids gym. Unlike others we have in the area, this one is run by a mom, and I can tell. Jumping Jacks is targeted toward a wide age range of children and their families. In the main gym, you'll find an inflatibles obstacle course, and a large moon bounce with basketball hoop inside. There are gymnastics mats, a climbing wall and all kinds of fun toys - like hula hoops, scooters, inflatible horses, etc. Upstairs is an XRKade filled with active, virtual reality type games like boxing, bicycling, skateboarding and more. The XRKade is particularly popular with older kids. This is a special place, run by a true mom and business woman who believes that fitness is supposed to be fun, and having fun is not just for little kids. So, Jumping Jacks offers much more than it's competition. Yes, birthday party packages are available and there is a nice private party room available for serving refreshments. But, because of the variety of features, even adults will enjoy this kind of an adventure, and JJS offers team building corporate events, too. 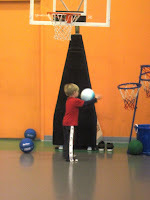 Yes, there are classes, but it's not just for the little ones, the age range is 2 to 12 for the various classes. There are day camps for summer and school holidays. This has saved me more than once, and unlike a drop in daycare option or babysitter, my kids get very excited when they end up spending the day at Jumping Jacks, so there's no fussing, whining or crying, and it prevents or cures cabin fever. If your kids are there for the whole day, they have arts and crafts and non-gym activities planned, too... but the real draw IS the open play, space, and options to do the high energy stuff that gets them into trouble at home. JJS also offers Family Challenge Nights. They have events and races planned based on expected attendance and age groups, and they even serve dinner. You race and play (REALLY play) with your kids of all ages and it is truly great fun. It's a much better alternative to watching a movie and ordering pizza at home - better for you, and way more exciting! You will get your heart rate up, probably break out into a sweat and work off stress and calories while having a great time with your family.... but nothing about it will feel like a work out. Isn't that what we all need in our lives?